Welcome! How can I help you and your dog? Dogs Little Helper is run by Jayne Lockey. My aim is to help people with all aspects of training their dog, from teaching basic manners to managing problem behaviour. If you adopt a pet from the Newcastle & Northumberland branch of the RSPCA I can provide free adoption support and training. Private lessons, behavioural consultations and puppy socialisation are my specialities, all aiming to improve the relationship between you and your dog. I can also give you advice and assistance on choosing your first puppy or shelter dog so you can make the best choices for you and your family. 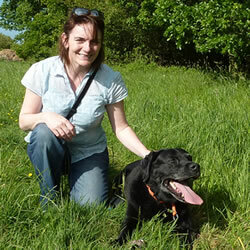 I provide 1-2-1 dog training using gentle, rewards-based and humane training methods. I won’t expect you to buy any special equipment but I will expect you to join in the fun!